Wild Strawberries is about an aged doctor, Isak Borg, traveling to receive an honorary degree. He is accompanied by his daughter-in-law, and during their car trip Isak recalls episodes from his past. Convention would assume the Professor is experiencing his memory due to the acute awareness of his own death, but Ingmar Bergman’s film is more celebratory of life and its creatures’ follies. Isak isn’t remembering because he is dying. He remembers because he is alive, and self-doubt is not reserved for the young. A lifetime achievement award seems to summon the end of one’s life, especially for those who have devoted all their passions to their work. Alfred Hitchcock, when receiving the honor from the American Film Institute, thanked his audience and proclaimed, “I think I will go on.” Sadly he didn’t, but Isak Borg will go as stubbornly as his still living elderly mother, going strong at 96. To understand the deeper truth to Bergman’s film, it helps to have an understanding of the director through his film work to see how his perspective changed with age, and in particular the transition period Bergman found himself in during Wild Strawberries. Bergman had made 16 movies before Wild Strawberries, and his cinematic counterpart had been actor Birger Malmsten, a handsome but gouache Swedish lead. In their films together, Malmsten portrayed an insecure, repressed young man wandering to find his way. His romances were messy and dangerous, and life was not kind. If Bergman never intended to make Malmsten his alter ego, the scripts the director was writing were certainly self-possessed. Isak Borg, in the context of Bergman’s heroes, is very telling of a director who for the first time was receiving great international praise for his work. Gone is the stubbornness and childish defiance of Malmsten’s characters. Isak has achieved something. Bergman had too, and their fears are that their accomplishments are meaningless; that they were frauds fooling at times even themselves; and the fear of being exposed as empty. Insecurities are not limited to the youth who are finding their way. Bergman was growing as an artist, but the fears any professional has, at least in Bergman’s case, did haunt him well into middle age. Lifetime recognition proclaims to others but most chillingly to the recipient that they’ve achieved all they can in their profession. We remember the past not as our former selves but as the people we are the moment we are remembering. “Flashbacks” as narrative devices are actually active moments in a film, existing in the present. 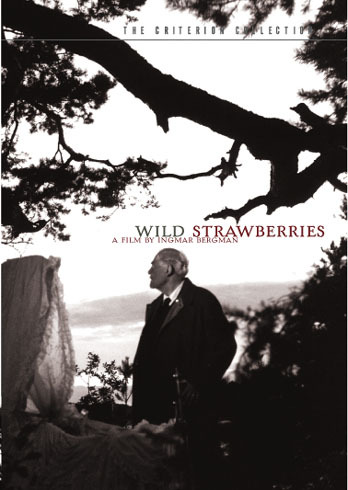 This is one of Wild Strawberries’ biggest accomplishments. Isak can remember the past, his eccentric extended family, the wild strawberry bushes on their property, with the insight of so many years’ experience. We all would do things differently if we could. Even without regrets; if we’re lucky, time gives us experience that allows us to become our selves. There is no one age where we truly understand who we are and the story isn’t written until the later years. That does not mean death. There is a beautiful moment at the climax (though that word might be inaccurate given the unique qualities of Bergman’s narrative structures) when Isak is taken to see his parents during the film’s final fantasy flashback sequence. He sees them from across a pond, and the expression on Victor Sjöström’s face is one of great serenity. He is not crying or gushing of happiness. What I’ve always been impressed with is Bergman’s lack of sentimentality; not because I dislike emotion. On the contrary, Bergman’s approach allows him to be honest, and instead of tears Isak Borg looks at his parents with fondness and understanding. Having lived a life of his own, sharing probably in similar emotional experiences as his parents, he can understand them and appreciate them as human beings. Convention would, after the Professor’s final flashback, tucked in bed and ready for sleep, allow Isak to die. In Hollywood storytelling that would tie things up, package the story, and give us a sense of resolution. Such endings are so pessimistic because life goes on, even for the elderly. Isak, I believe, undergoes some very profound and subtle changes that allow him to grow at his old age. It’s great that Bergman will allow his character the dignity to experience at least one more day with this new perspective. The youth in the film is very special. They oddly are liberated from doubt. They are carefree and hopeful. Bibi Andersson, one of Bergman’s many brilliant leading ladies, plays a duel-role: Sara, Isak’s cousin in the flashbacks, the woman he loved and wanted to marry, and Sara, a hitchhiker going with two male friends to Italy. Let’s talk about the modern-day Sara. Her biggest woe is deciding which of her boyfriends she really likes. There’s Viktor, a theologian, and Anders, a doctor. Their fights over God give the film its biggest laugh. They box over God’s existence, and when they return defeated to Sara, she asks, “Does God exist?” Andersson is especially sweet, and her scenes give the film much of its beauty. Sara of the past is theatrical, possessing the neurosis apt of a formal, hierarchal society. In the modern world of the film, the elderly retreat into themselves: Isak, of course; his mother, and Miss Agda, Isak’s housekeeper and comic combatant. Isak’s son and daughter-in-law are repeating the mistakes of the past, but the new youth is hope for the future. Isak and Marianne, his daughter-in-law; their relationship I found intriguing. Maybe because it is so unusual to see this family relation depicted in fiction, but it is poignant that Isak discovers much about his own son through the conversations with Marianne. Evald, the son, is a stranger to Isak and yet he hates his elderly father. Isak is surprised by this, but he accepts it. Maybe his son’s feelings are understandable to him. The two opposing characters, Isak and Marianne, traveling in a car, might make the film seem like a buddy picture, but Wild Strawberries lacks the required and implausible confessions and revelations seen in the genre. Instead these characters experience growth unparalleled in most films. By depicting moments—conversations, glances, experiences not directly related to plot (the visit to Isak’s mother, for example) Bergman, as he nearly always does, gives us people more than characters. The film is a bridge between Bergman’s past and future work. He has the formal structure and the theatrical rhythm typical of his early film. Bergman came from the theatre, and he continued to write his films like plays, and many of his published screenplays are indeed in play form. His cinematographer during the 1950s, Gunnar Fisher, achieves his most delicate work in Wild Strawberries, a more naturalistic view of the world that looks ahead to Bergman’s work with the masterful Sven Nykvist. Bergman’s screenplay and scenario is more typical of the chamber dramas that define his 60s and 70s output. Isak Borg will make way for the weak, mawkish male figures in films like Persona, Shame, and Scenes from a Marriage. As Bergman’s success increased, his insecurities did too, but it is easy to imagine the director at peace towards the end of his own life—a journey we can imagine as frightful and full as Isak Borg’s. His last films are proof of this; Fanny and Alexander and Saraband are rich in their human qualities. Sorrow still exists but the director had realized that the poor parts of life are eclipsed by the joys, and he was talented enough to make these beautiful moments as profound and rich as the heavy drama. These films show the great Bergman characters accepting peace where they find it, and where the past has made room for it.